DEKC Maritime has been responsible for the design and engineering of a retrofit of a self-propelled jack-up vessel. For this retrofit, the spudcans (the “feet” of the jacking legs) were increased in size to lower the pressure exerted on the sea bed. Also, to increase the cargo capacity, the design draft was increased and sponsons were added along the side of the vessel. The enlarged spudcans, deeper draft, and increased beam of the upgraded vessel have a significant impact on its hydrodynamic properties. This is especially the case for the enlarged spudcans, which are too big to be recessed in the hull. Since no modifications were to be made to the propulsion system, keeping the extra resistance low was essential, such that the speed loss from the original 12 kn design speed would be minimized. Therefore, to avoid excessive drag, DEKC Maritime designed streamlined flow bodies around the spudcans and integrated these with the design of the sponsons. Shown below are the original configuration (with blue spudcans), the new configuration (green spudcans) without flow bodies, and the final configuration with flow bodies (shown in red). The design of the sponsons and flow bodies geometry was performed using CAESES. Extensive use was made of CAESES’ built-in tools, such as f-splines and meta-surfaces, for creating the geometry, and additional features were scripted as necessary. The resulting geometry was defined by the existing hull shape and by a number of key design parameters. These design parameters were subsequently constrained to achieve a design that provided both minimal resistance while still satisfying construction requirements. To assess and minimize the effects of the upgrades on the vessel’s resistance and propulsion, DEKC Maritime created an initial set of concepts and analyzed these in FINE/Marine. 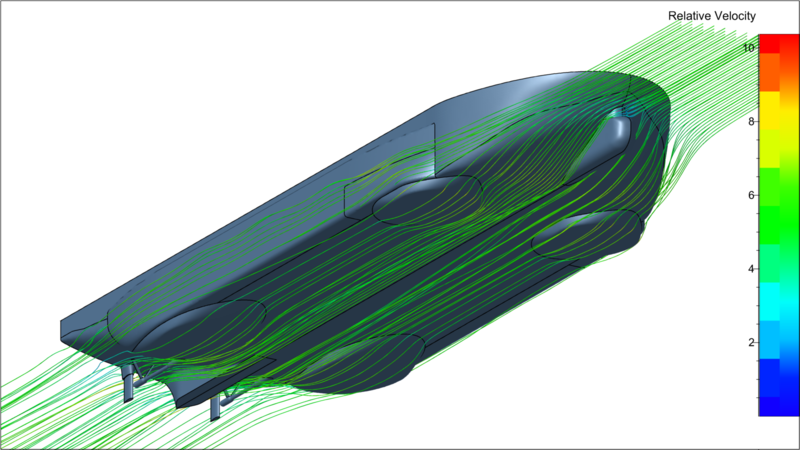 This allowed the most promising design parameters to be identified for a more extensive optimization analysis. During this step, the sponson geometry was specifically tailored to reduce the wave-making resistance as much as possible. The fine optimization was performed using the software connection functionality of CAESES to interact with FINE/Marine in an automated fashion, as well as exploiting CAESES’s built-in optimization routines. A two-stage optimization was used, with a Sobol method first sampling the design space, followed by a gradient method to converge on the optimum. 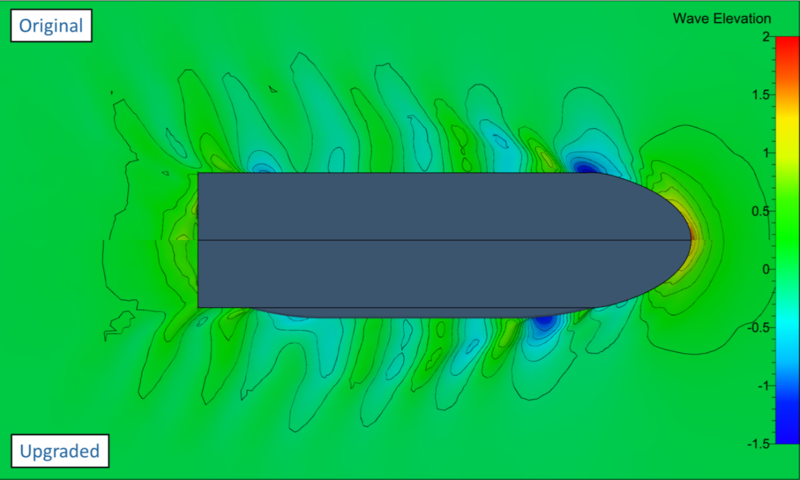 Based on this analysis, a final configuration was found which would allow the vessel to achieve a new design speed of 11 kn. After the optimization, the CAESES defined shapes were exported and directly used for the detail engineering of building sections and creation of production information for these sections. This is quite exceptional and an excellent indication of the high quality of the geometry created in CAESES. 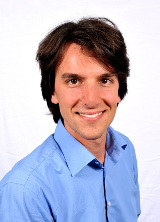 Harry Linskens is a naval architect and fluid dynamics specialist at DEKC Maritime in Groningen, The Netherlands. After graduating with an MSc in aerospace engineering from the Delft University of Technology, he decided to switch fields to the maritime industry for its practical and no-nonsense attitude. Currently, he is involved with concept design, stability analysis, seakeeping studies, and resistance and propulsion calculations. Thanks a lot to DEKC Maritime for sharing this information. Feel free to get in touch with us if you have questions about this case study. Please see also our marine section for more information about ship hull design and optimization.